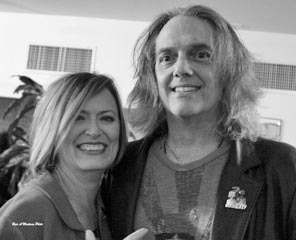 A benefit for area musician George Meyer, who is pictured with his wife Pamela Moore, is scheduled for Sun., March 8 in Asbury Park. It is now time to help an area musician who has helped many others over the years. George Meyer, a long-time member of the Blackberry Blues Band, is undergoing chemotherapy for cancer and a benefit is being held this Sun., March 8 to support him and help cover medical expenses. “George has a long musical history and he has done many benefits for others in the past. And, this time, it’s for George. George and I have done many benefits over the years and we are doing this benefit to love and support him- both financially and emotionally. I hope people turn out- it will be a great show,” said his fellow band member David Meyers of Neptune. The benefit will be held at McLoone Supper Club on the Asbury Park boardwalk, in the Fifth Avenue Pavilion, from 2 to 7 p.m. with doors opening at 1 p.m. A minimum $10 donation is requested to attend. Meyer’s new band, One Came Down, will also debut at the benefit. “And hopefully George will feel well enough to play,” Meyers said. And the fundraiser has quite a lineup of talent, including Billy Hector, Marc Ribler, JT Bowen, Stringbean, Tommy LaBella, Gerry Carboy, Layonne Holmes, Joe DeMaio, Pamela Moore, Peter Myers and Paul Whistler. Also performing are Al Holmes, Gary Van Sycoc from John Lennon’s Plastic Ono Band, Chuck Lambert, Sandy Mack, and of course, the Blackberry Blues Band. There will also be a raffle of various prizes and a 50/50 raffle. Meyer has played with Meatloaf and Ian Hunter and his wife, Pamela Moore, is a well-known singer and has performed with Meatloaf and with Bob Seeger’s Silver Bullet Band. Meyer, 66, and his wife live in Middletown, NY. The band was originally called the Blackberry Booze Band when it was formed around 1972 and some later members included Southside Johnny Lyon and Steve Van Zandt. “We were also the Stone Pony’s house band and Bruce Springsteen started coming down to play- and the rest is history,” Meyers said. The band was also part of Southside Johnny and the Asbury Jukes for awhile and then became the backup band for Corky Laing, the drummer in Mountain. The Blackberry Blues Band was founded by bassist Meyers and guitarist Paul Dickler and is considered one of the seminal bands and influences of what has become known as the sound of Asbury Park.